I continued working through Power Legion yesterday. Again I pitted Batman and Batgirl against the Joker, Riddler and Harley Quinn. This scenario saw the Joker destroying all of the phone booths in Gotham (there were four on the board). Not sure why the phone booths had to go--perhaps he picked up a contract from a cell service provider ("from the people who brought you brain cancer..."). In any event, placement was random. Batman started on the north edge and BatGirl on the west. 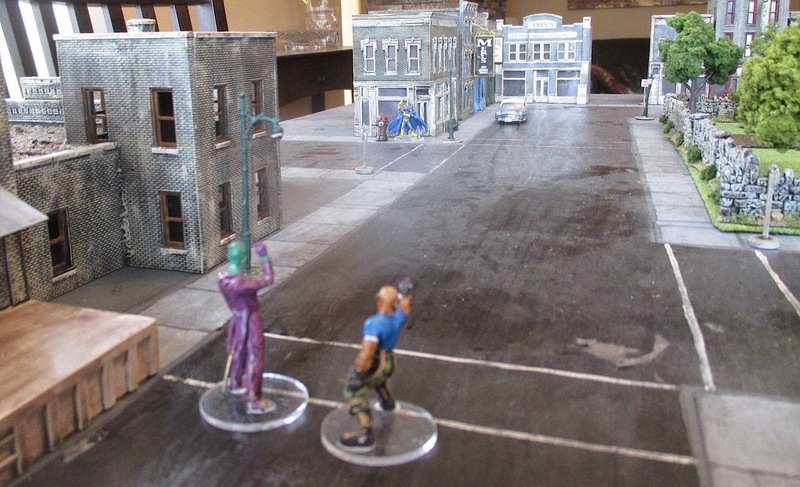 The Riddler and three goons started on the east edge while Harley Quinn and a goon started in the SE and Joker and a goon in the SW. Riddler moved first, ran out in front of Batman and tried shooting up the phone booth. Riddle me this: WHY CAN'T YOU HIT ANYTHING? 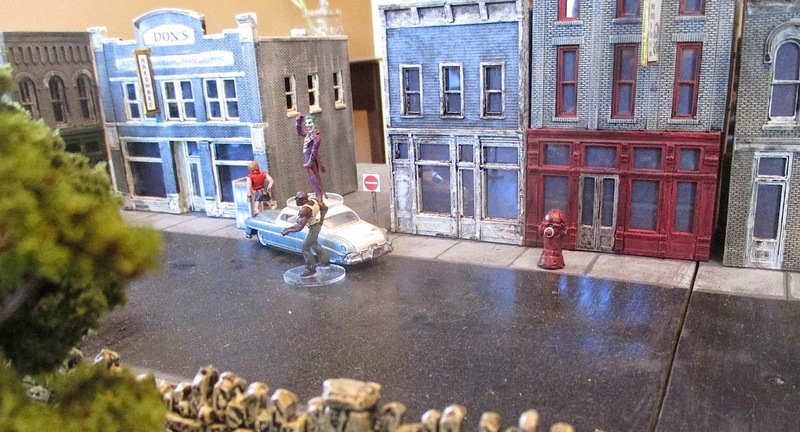 In the SE corner, Harley Quinn decided to toss a grenade in the phone booth. But missed and, of course, KOed herself. The goon must have been rattled because he proved completely incapable of busting the phone booth up for the rest of the game. 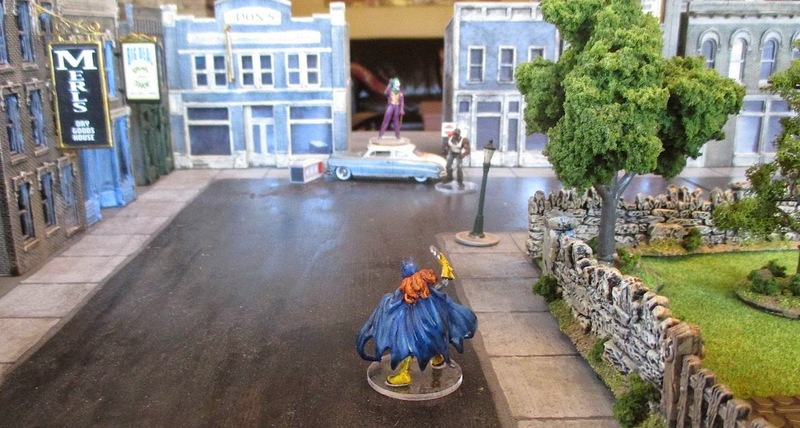 In the SW, the Joker and his goon moved north, towards Batgirl. Along the way, Joker ripped up the first phone booth with his Tommy Gun. 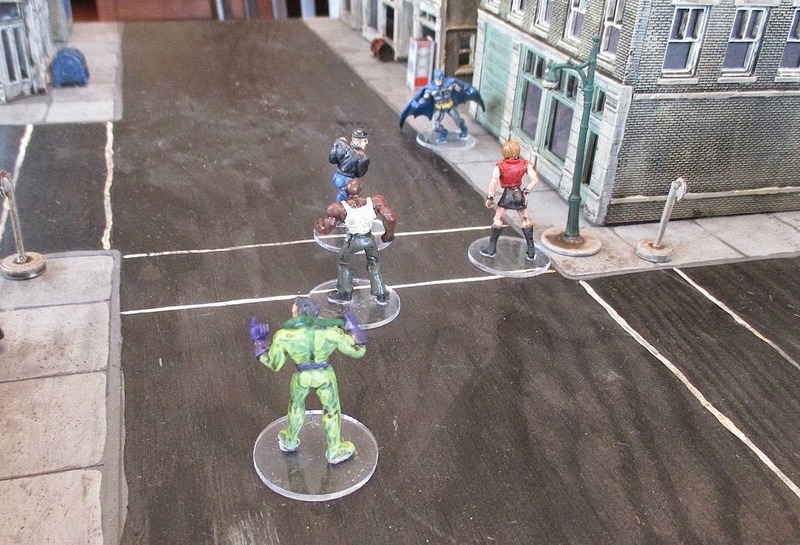 Back at the north end of the board, Batman swung forward on a Batrope and found himself mixing it up with three goons while the Riddler (uselessly) tried to hose down the phone booth behind Batman. 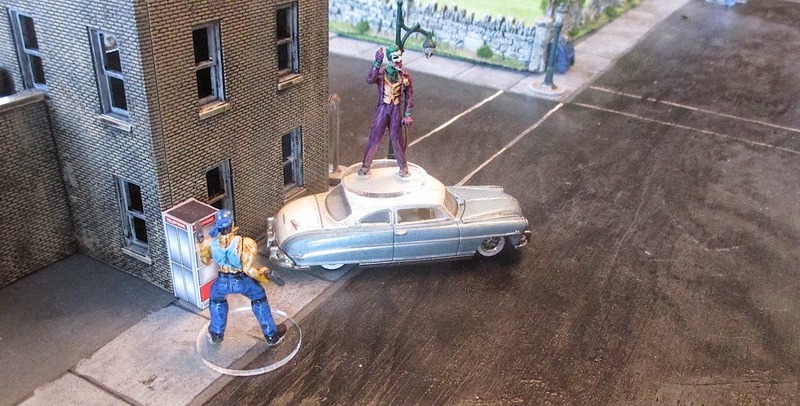 Meanwhile, Batgirl held off one goon with Batmace while the Joker ran towards an idling car (the peak oil thesis being as yet unknown to Gotham's underworld). Batman eventually pounded the Riddler's goons into submission but missed his charge into the Riddler. The Joker tried to run Batgirl down but she managed to jump out of the way. Then Batgirl missed her activation roll and the bad guys got a double impulse. 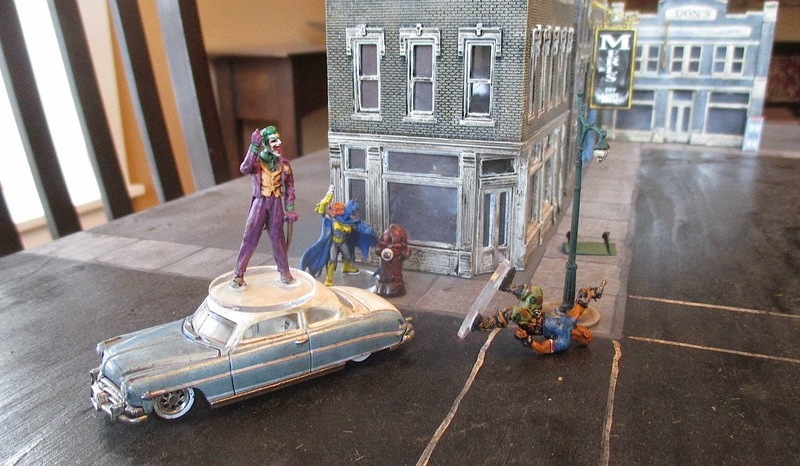 Joker decided to head over to help Harley Quinn's goon. But somehow he missed the phone booth with the car. Twice. (The phonebooth rolled a d4 for agility). In the north, an epic, backlit struggle between Batman and the Riddler raged while the Riddler's goons got back on their feet, split up and ran to the nearest phone booths, destroying a second booth. Seeing things start to get out of hand, Batman knocked Riddler down and sprinted towards Joker, who had wisely held back an action. 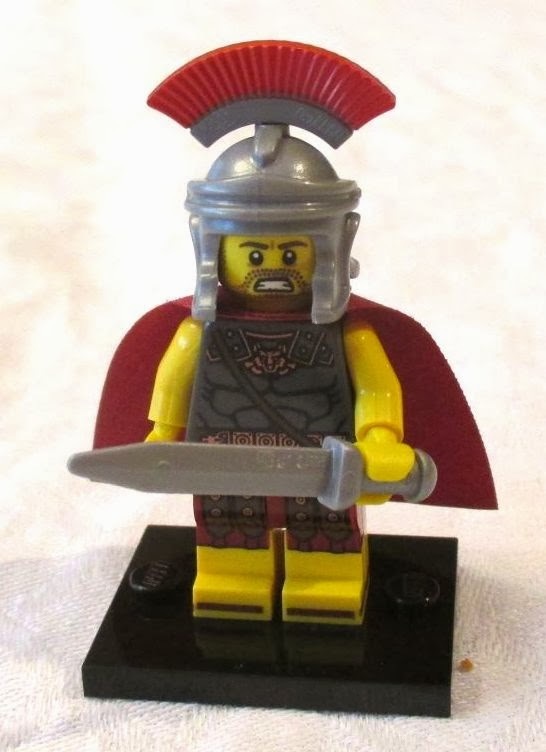 He used it to gun the car at Bats, who dove over the hood and rolled to his feet. The Joker's driving was simply insanely bad this game. 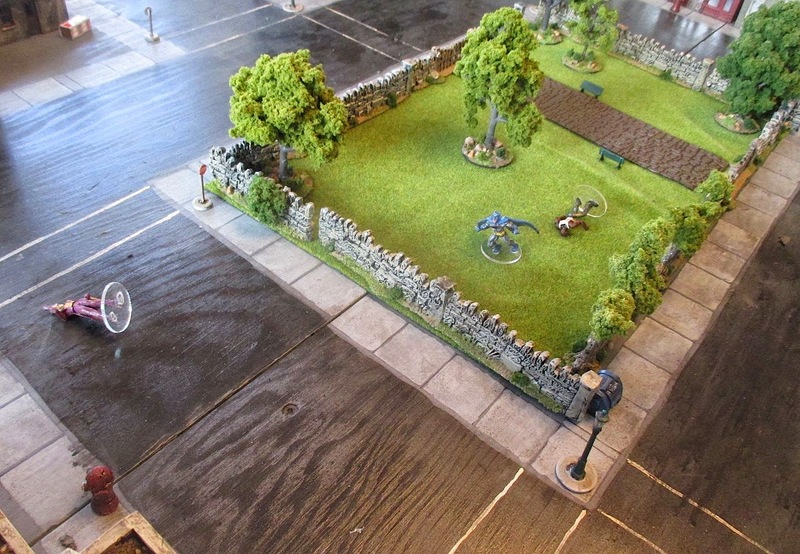 Bats ran forward and KOed Harley Quinn's hapless goon. In the meantime, the Joker fishtailed his way towards the third phone booth in the NW corner. One of Riddler's goon was trying to break the phone booth with her hands. In character, the Joker ran her down (KOing her) and also smeared the phone booth. Batman ran towards Joker but got knocked down by a bomb from the Riddler. With Batman out of the play for a minute Batgirl whipped her Batblowgun out of her utility belt and flattened the car's tires. Joker got out, swore and ran at Batgirl. A fistfight ensued causing Batgirl to get KOed. The Joker was heard to mutter "This has been a lot easier since you started applying the armour rules correctly!" 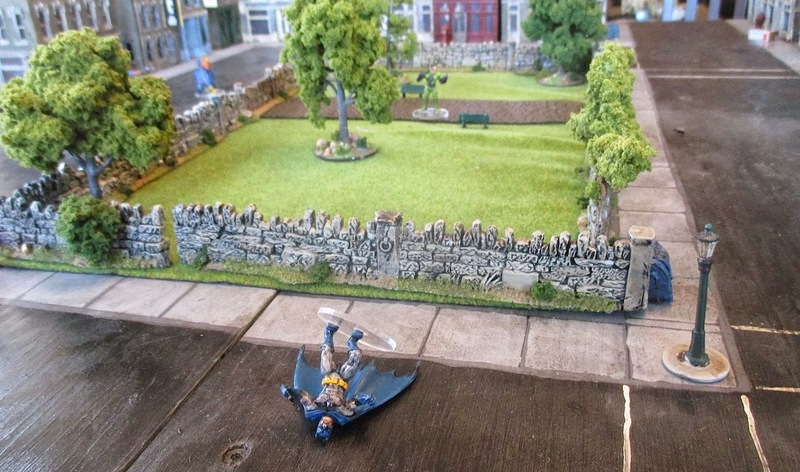 In the meantime, Batman jumped back to his feet, KOed the Riddler in the middle of the park and dodged a charge by the remaining goon. With the Joker hotfooting it towards the last phone booth, Batman punched out the goon, ran forward to get a line of sight on Joker and then let loose a batarang than knocked Joker down. A close-run win for the good guys. I felt like I had a better handle on the rules and the game was very comic bookish (which is what I was looking for). I'm starting to see how the characters handle differently and I like how characteristics can be assigned to inanimate objects. I also quite like the gadget rules (although I am playing them a bit looser than the rules suggest). Hey Bob! Bring this out to the club so we can all have fun with it! What better way to playtest!